Ok, so I got a concerned letter from Roxanne the other day and I just need to clear something up. I had said last week that I was possibly going to get released, I should have been more clear. I might get released from zone leader, not the mission. President said that it was up to me to decide, but I'm going to say where I am at. Sorry if I wasn't clear enough. This week has been great due to the fact that I have been sleeping much better. While I am thinking of it, transfers are next week, so no e-mail until Wednesday. This week a new meal coordinator was called, Sister Syme. The last 4-5 weeks we haven't had a meal coordinator which has made it hard for us to work with the members. Our meal calendar is online which we obviously can't get to or see and the communication from the calendar to us is lack-luster, so dinner appointments were missed, hence loosing members trust, which worked against us to help the members to do their missionary work. So Sis. Syme is in charge and she is so excited to work with us. She already invited a less-active to church and over to her house. Yesterday in fast and testimony meeting she got up to bear her testimony and challenged all the members to invite a friend to watch General Conference with them. She is rockin! The part member family that I told you about last week is still doing great. We weren't able to meet with them this week because of an unseen visit from a old acquaintance, be we are lined up for next week. We also are working with another less-active/part member family. We are going to have a BBQ with them and build some relationships with them. The non-member in the family has mentioned baptism to her husband, so we are going to check it out. This is just a heads up, the price of corn has gone up a TON. It is over 6X higher than it was last summer, so this summer's prices are going to shoot up. Stock up now! Thought I would mention it, I'm in the heartland on corn for heaven sakes. This morning we started running. I fell off the wagon after Elder Curtis left, no more diet and our YMCA membership ran out, so subsequently I'm not up to par. There is only so much you can do to work out in your apartment. So we got talking to a less-active (who is part of another part-member family!!) and he wanted to start running in the morning to get ready for basic training, but he wanted someone to run with. We thought that it would be a good way to build a relationship with him so we can get in the door and get him active again as well as teach his fiance. But unlike Phoenix it was 27 degrees this morning, a little chilly. Things are going great, thanks for the tapes and stamps Mom, you are always on top of things. Its finally spring. That winter was a tough one. As of Sunday we have a progressing investigator. Its been almost five weeks since our teaching pool dropped us, but now were on the rebound. We are teaching a less-active/part member family. We have been trying to get a hold of this family for the last 4 months, but finally we caught them home. Missionaries are so persistent. We taught them yesterday after church with one of their home teachers. It went real well, she has a lot of questions which is nice. Her husband wants to be active and have her baptized, so he is excited. They also have a 9 year old that we are going to try to involve into the lessons to get him baptized as well. It was the first real lesson that Elder Perfili and I have taught together but I think that it went smooth. She said that she would be baptized if she found out our message was true. The only thing is, is that she doesn't believe in "religion". She believes in God and Jesus Christ, but to say that that there is one religion that is the "right one" is a foreign concept to her. So I think that I am going to use the game Break the Ice, or Jenga, to illustrate the church that Christ established and the apostasy that followed. It's going to take some time but I think that she will understand that Christ created one church upon the earth at the time of His earthly ministry. This week has been a draining one. We had interviews on Wednesday so we had to go to Ames and them back to Ankeny to interview both districts, then we went on an exchange with Newton, Marshalltown, and Ames 1st ward. This week will be the first normal week of the transfer and it's week 4! But that's par for the course. I haven't been sleeping well at night for the last 6 months and it is starting to catch up to me. I talked to President about it and we are going to try a few different things with missionary medical to get it straightened out. He mentioned releasing me, but we will see what happens. You asked about how I found out about how the Brown family and the Bensons knew each other. We were over at the Brown's house and got talking about where they were originally from. Brother Brown said that he was from Corona, California. So I just asked if he knew the Benson family, and he said that Kevin Benson was his young men's advisor. Then I told him that he was my uncle, and we got talking about the family and what the Bensons are up to now and everything. By the way it was Shawn Brown who lives in my ward. You had said that Grandpa was reading my letters and liked them and everything. Everyone also says that, that my letter are so great or something to that nature. I wanted to ask, Why do you find my letters so great? I think they are very basic, but I wanted to know what you thought. P.S. When ever you send your next package, no rush, could you throw some cassette tapes and stamps in there? I don't have too much time to talk, we are helping a new family move into the ward in a little bit. I did get your package with the backpack in it. Thank you, it works great. Ok, to you will have to tell Aunt Lauri that there are some old friends of hers here in my ward, the Brown family. I guess that they know each other from Corona. Uncle Kevin was Brother Brown's Young Men's advisor, crazy. 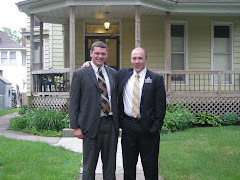 Elder Perfili and I have been on exchanges all week. We had zone conference on Tuesday and then exchanges with 4 wards in the Ames area. It was so much fun. 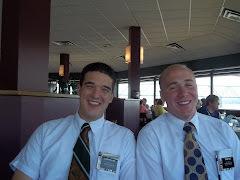 I was able to go out with Elder Eldredge for a day in the Ames YSA, I miss that guy. We also had a mission fast on Sunday for our mission goal. On Saturday we were able to go to a baptism for a young man named M G. He was baptized in the Ames 2nd ward. The week has flown by and I don't have too much to say about myself. I hope that everything at home is great. The weather here is starting to warm up, it stays in the 30's and 40's. I know . . . what a miracle. That's warm for us, we are finally able to take our winter coats off and just be good in our suit coats!! I sent a package home last week, did you get it? I haven't heard from you guys this week, is everything ok? I sent a letter home as well, I hope you got that too. This week has been a little rocky. My companion and I are not used to each other yet but it will come in time. QUESTIONS - BECAUSE WE NEED TO KNOW . . .
You said something in your e-mail last week that I didn't know what it means, but then I saw that your mission president used it too. You said " . . . a little IDMM comin' at ya." What does IDMM stand for? What do you see out your living room window? Currently I see a blizzard with 40 mile an hour winds and 6 inches of snow. Tonight the mission was told to go inside and stay there until the storm passes. I guess it was really bad. Elder Curtis and I wanted to go tracting, but President said otherwise. Do you ride your bike anymore? How many miles do you put on your car in an average week? That's a funny story. I actually don't know where my bike is right now. I haven't had to use it since my first 6 weeks in Clinton. When I was at transfer meeting between Fort Dodge and Ankeny, the member that was taking us to Ankeny did not have room for my bike, so I put it in the AP's trailer. Now it is either in the mission home garage or it is in the AP's garage. In an average week we put about 275 miles on our car, give or take. Do you ever do anything that bugs your companion? When I try to finish his sentences . . . incorrectly. He hates that. 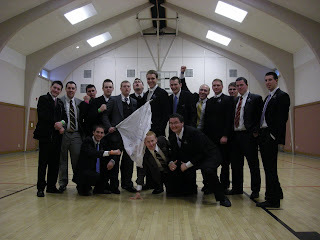 What is Elder Curtis' best quality? Elder Curtis is really good at dancing off-beat. I have a video of him and it's so funny. Another one is that he has no real extreme emotions. He never gets excited or sad. He has no extremes which is good to be around. No drama, no contention, no fighting, no arguing. What activities do you do on P-day (besides laundry and sending an awesome letter to your mom every week)? Well other than that we go to Wally World (Wal-Mart). I've never had any real drive to "go out" and do anything on P-day. All week long we are running around without a chance to catch our breath. So when we have a day to organize ourselves, I'll take it. Mondays are almost like a Sunday, the day of rest. 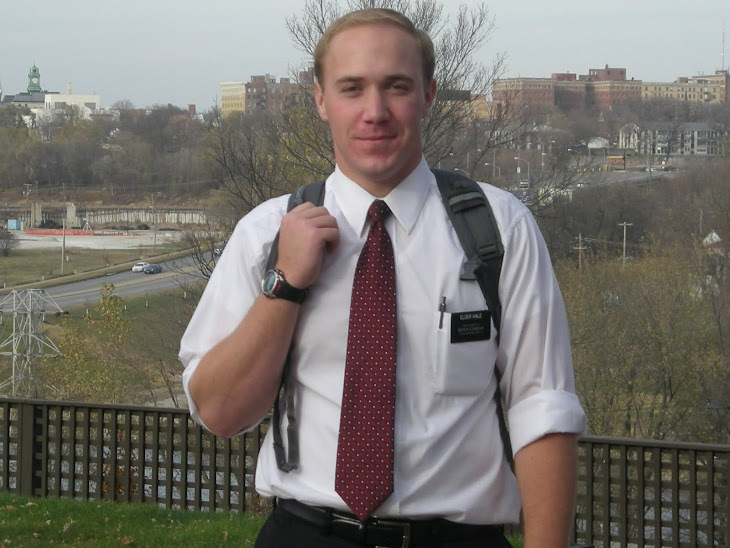 Who is the better housekeeper, you or Elder Curtis? I think I am more tidy than Elder Curtis, but he's more willing to do the dishes. Who is the better cook? We both use the George Foreman, so we are tied. Is there anything you've ever seen in Iowa that you thought - "You'd never see that in Arizona!" No, nothing. So much nothing. No professional teams, no amusement parks, nothing. Just a far-see of fields and highways.